The No. 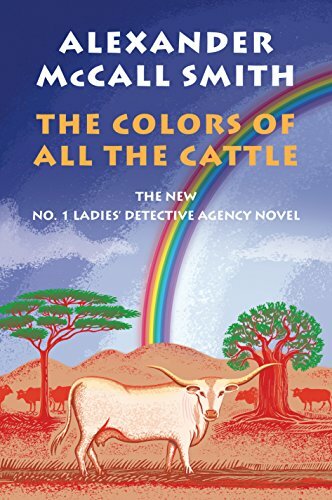 1 Ladies Detective Agency series is in its 20th year, and the 19th novel is The Colors of All the Cattle. For fans of the series, the new book doesn’t disappoint. Once again we’re drawn into the different but engaging world of Botswana. The people demonstrate an old fashioned courtesy that is believable in a place so foreign to us all. We could only wish the humming world of social media and cable TV in the U.S. would portray some characters that are as refreshingly nice as Mma Ramotswe and her friends. In a time when politics can be so vitriolic here, it’s interesting to see the “traditionally built” and always gracious detective drawn into a local election. Faced with the demand of one of her dearest friends to stand for office and help defeat a plan to build a “Big Fun Hotel” right beside a graveyard, Mma Ramotswe is torn between a sense of duty and her own humility. Will she run or not? Honest doubts about whether she is worthy to run make Mma Rabotswe quite a contrast to some famous American politicians. At the same time she mentors her young employee, Charlie, as he investigates his first case which is a hit and run. Charlie also underestimates himself when he discovers his new girlfriend comes from a wealthy background. He thinks he’s not worthy of her because her father is a “big man.” “You’re a big man, too,” Mma Mkutsi tells him. Perhaps the stories in this series are so popular because they take the reader to a world that smells and feels different from the ordinary. Yet the people and the basic dilemmas are people we can identify with. A mother is the one who knows the truth about her son, the victim might choose a punishment that gives a young man another chance even when his daughter asks how many chances should be given to the guilty. “However many chances are necessary,” Precious Ramotswe tells her. The dilemma of a political career for the busy detective is cleverly resolved by the end of the book, just as the hit and run is solved. And, of course, the Big Fun Hotel is not allowed to disturb the peace of the “those who are late” by which she means the dead, including her own father. Very different from the shoot ’em up, grand thrillers about tough men that are so popular these days, The Colors of All the Cattle and the other books in the No. 1 Ladies Detective Agency series are quieter and slower. But they are in many ways more realistic and more satisfying than thrillers or even other “cozy” mysteries. The new book is an easy comfortable read that still manages to bother you with dilemmas and also delight you with clever conclusions. It provides an engaging trip into a world that is simpler and warmer than the one you leave behind. It is another romp in Precious Ramotswe’s “beloved Botswana bush” that fans of the series will not want to miss. Frances McNamara is the author of the Emily Cabot Mysteries series.